At something over 5 million people, Luanda is now one of Africa's major metropolitan areas. While every city follows its own historical path, Luanda provides fascinating insights into urban transformation in Africa. Like so many places in sub-Saharan Africa, Luanda was developed as a colonial city. The Portuguese arrived in the 16th century to Christianize the people, deal in slaves and search for precious minerals. The slaves were held in the fort atop the hill overlooking the harbour, before being baptized and marched to the ships that would take them across the Atlantic to plantations in the New World. The fort and the port are not the only surviving symbols of that era. In the Miramar area, with its commanding views down to the sea, the remaining elegant villas of the Portuguese rulers are now largely used as embassies. The commercial area by the port still has some fine colonial buildings (and some very mundane Portugues additions from the 1960s), though it has undergone a massive change in recent years. The liberation struggle began in the early 1960s and ended in 1974 when the coup in Portugal ousted the extreme right Salazar regime. The film Independencia provides eye witness accounts of that history. A bloody civil war followed the precipitous withdrawal of the Portuguese. As the fighting was mainly in the countryside, there was strong migration into Luanda and a mushrooming of informal settlements, known locally as musseques. in and around the city. 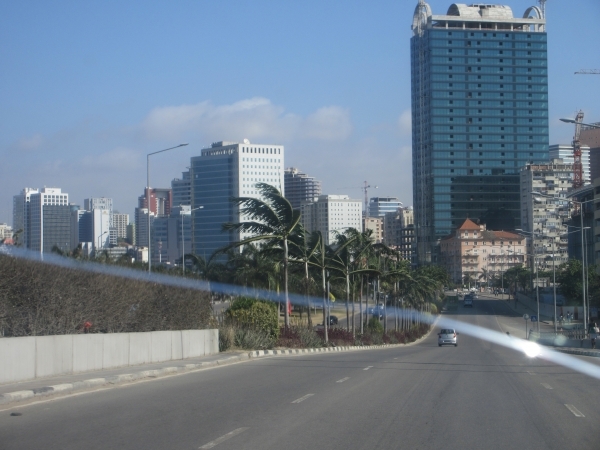 However, investment had halted and Luanda was both crowded and crumbling. Peace came in 2002, with the MPLA (Popular Movement for the Liberation of Angola) in control of the country. For a dozen years oil wealth sluiced through Luanda's economy. The high oil prices, and a further economic boost from diamonds, provided Angola with a much needed opportunity to build a post-conflict city. The chance was taken, but the form of the development is open to criticism. In little over a decade the skyline of the central business area around the port changed dramatically. Steel and glass office towers now dwarf the low-rise peeling pastel-shaded remnants of the Portuguese legacy. Claudia Gastrow has interpreted this "hyperbuilding" as an attempt to rebrand Luanda as a "world city". She attributes it to a combination of transnational capital speculation and an attempt to entrench the power of the MPLA. This urban transformation extends well beyond the commercial core of the city. I visited expanding suburbs to the south and south east that reminded me of the kind of sprawl you see around Johannesburg or many American cities. There are business parks aplenty, shopping malls set back behind baking tarmac'ed car parking areas, and the barbed-wire tipped walls of gated communities. It is out here that the new African middle class is forging a car-dependent life style based on traffic-clogged wide roads, media centres, private schools and clinics. Retrofitting such areas to make them amenable to public transport will be a task for the future. Beyond these suburbs lie satellite towns, built to much higher densities, and resembling the kind of high rise grid complexes familiar in China. That might not be too surprising, as they are Chinese in origin. As Cezary Bednarski describes, finance for development was provided by the Chinese, through oil-backed loans. He describes the 20,000 apartments provided in 710 buildings in Kilamba, 20 km from the centre of Luanda, as "the biggest project thus far built by the Chinese outside of China". Bednarski questions whether the Chinese high rise approach is appropriate in a society used to ground-level social interaction and blighted by power cuts. He aiso raises practical concerns about maintenance: "How do you repair a leaking window or a façade defect on 10th floor? Nobody will ever erect scaffolding to this height to deal with a leaking window. Thus deterioration will continue." In her research Gastrow also found unease amongst Luanda residents about the ways their town was being constructed. She summarises the responses of interviewees:"the buildings were not designed to accommodate Angolan families, made certain informal socio-economic activities untenable, and were environmentally inappropriate for the city." The main informal settlement area I visited was Boa Vista, which is squeezed between the industrial areas at the back of the port and Miramar on the hill. The subsoil is soft and sandy, and there was plenty of evidence of landslips - when it rains in this tropical place it really rains hard! Of course, areas vulneable to hazards but accessible to jobs are a typical location for informal housing development across countries where planning control has been weak or non-existent. Boa Vista was the site of the first major demolition in 2001. An estimated 4000 people were evicted and relocated to Zango, one of the satellite towns.Then in 2009 there were more evictions to clear land for the Jardim de Eden property development on the edge of Miramar. Many major housing and redevelopment projects appear to be handled directly by the President's office, as Gastrow's article explains. In my workshops I explained the Sustainable Development Goals, the New Urban Agenda and the UN-Habitat International Guidelines on Urban and Territorial Planning. We particularly spent some time discussing the Urban Goal, SDG 11 that aims to make cities and human settlements safe, inclusive, resilient and sustainable. It's a pity we did not have it 15 years ago. Hopefully the fall in oil price may provide an opportunity to think again about the form of development for the city. The fact that we do have an Urban Goal amongst the SDGs owes much to China's support for it: the UK and the USA were reluctant converts. Meanwhile in Angola and across other African countries China has come forward with finance for development, while eschewing Western sensibilities about corruption and lack of transparency. In return they have secured long-term access to key resources - a form of resilience. So what we are seeing in Luanda is a local practice that is contesting Western and colonial traditions, yet also restructuring African urbanism. It is in places like this that the history of this urban age is being written.